Hundreds of miles of trails invite you to take part in some Glacier National Park hiking on your vacation to this area of glacier lakes, snow-capped mountains and lovely forests. 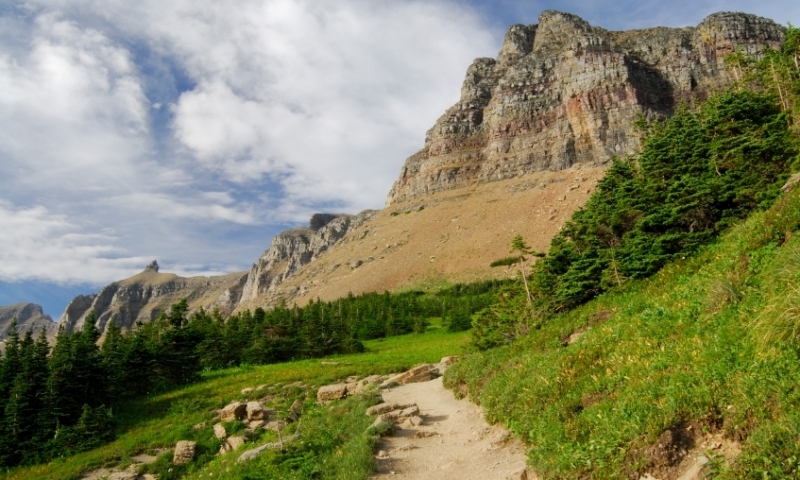 To know Glacier & Waterton Parks is to hike them. 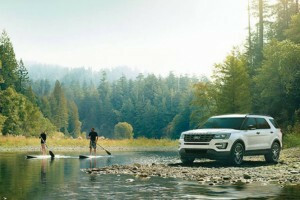 Our naturalist guides take you to amazing locations, but don't wear you out. Authentic, yet refined. Lodging, dining & more. The world's leading adventure travel company - enjoy Biking, Hiking, or a multi sport Family trip in some of the all time best locations. "See the Route, Follow the Route", a unique climbing guide for hiking and climbing in Glacier designed for the beginner and intermediate. Hike into Glacier's ancient forests on our 6-day, 5-night Guided Walking tour. Regal scenery unfolds by day, with warm historic lodging by night. Offering guide-led winter activities (X-C, backcountry ski & snowshoe tours) and hiking and climbing treks in summer in and around Glacier Park. Hiking in Glacier National Park is one of the favorite outdoor recreational options within the wilderness areas of this amazing park. The whole family can go on a short hike, or the experienced hiker can embark on a backcountry adventure to beat all others. The glaciers, mountain peaks and alpine meadows are like nothing you’ve seen anywhere else. When Glacier hiking is the best, you will find this self-guided nature trail starting you out on a boardwalk and then winding through the forest to Avalanche Gorge, carved out by the Avalanche Creek. Accessed at the Avalanche Picnic Area. When you reach Rocky Point on this easy trek, you will find lovely views of Lake McDonald as you come out of the forest. Find this trailhead .2 miles north of the Fish Creek Campground. You can travel this trail by foot or bike, through dense forest and foliage. The kids love this path through Glacier. To get to this trailhead, turn right after you cross McDonald Creek Bridge on Camas Road. This easy hike of one hour one-way begins with paved trail and then continues with steps and a boardwalk, protecting the land over which it wanders. Enjoy the alpine flowers blooming if you are there in the spring and summer. This trailhead begins at the Logan Pass Visitor Center. See the beautiful colors within this glacier-fed lake on an easy hike through Glacier, and see five waterfalls cascading down the mountains into the lake. On the east side of Glacier National Park, the trailhead is located at the Avalanche Gorge Bridge on the Trail of the Cedars. The sounds of the wildlife will amaze you if you stop and listen on this easy hike to Howe Lake. You’ll hear woodpeckers and see loons flying above. To get to Upper Howe Lake, you’ll need to hike through the surrounding marshland. The trailhead is marked as you travel on the Inside North Fork Road. You’ll enjoy this easy hike through dense cedar forests, with the white pines and Douglas firs becoming more prevalent as you reach the higher elevations. Starts at the Sperry Trailhead across from Lake McDonald Lodge. 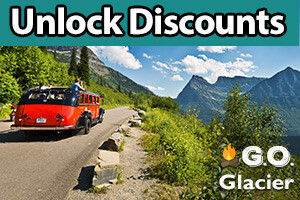 This is a nice easy hike where the whole family can enjoy some quality time in Glacier National Park. Hike through gorgeous forests to Johns Lake. Reach Johns Lake Trailhead on the Going to the Sun Road, about one and a half miles past the Lake McDonald Lodge. From the top of Apgar Mountain you get an incredible view of high snow-capped peaks and Lake McDonald. This moderate hike is a great one for all ages. To get to this trailhead, take the first left past the west entrance and follow the road for 1.5 miles past the Quarter Circle Bridge. This interesting trail starts close to the shore of Lake McDonald and goes on up to the top of Howe Ridge. Then you begin the steep descent to Trout Lake and Camas Creek. Marked as Trout Lake Trailhead, 1.5 miles west on the North Lake McDonald Road. Although you often can’t see Synder Creek while the trail parallels it, you will get some lovely views of Lake McDonald on this hike. The lower lake lies below a band of cliffs in the canyon wall. When you reach No Name Lake you’ll see the awesome rock cliffs of Pumpelly Pillar. Great hike for some spectacular scenery. Start out at the Two Medicine Lake North Shore Trailhead. This hike is on the east side of the park off Going to the Sun Road and offers plenty of shady hiking with lovely places to stop to see a waterfall or pool. Cross a wooden bridge over a creek before you get to the gorgeous blue-green Otokomi Lake. This trailhead is located next to the Rising Sun Campstore near St. Mary Lake. This is a steep hike and strenuous, but well worth the effort when you see the spectacular views. This moderate trail hike takes you around the south shore of the Two Medicine Lake and up to Two Medicine Pass before dropping down into the Park Creek Valley. Get the trailhead at the South Shore Trailhead at the Two Medicine lower boat dock. This is a fairly strenuous trek to one of the most popular fire lookouts in Glacier. Enjoy fabulous views of the Livingston Mountain Range. Go north on Camas Road out of Apgar to the Huckleberry Mountain Trailhead. The Beaver Pond Loop is an easy trek taking you past lovely views of waterfalls and cliffs. Find this trailhead at the 1913 Ranger Station at the east end of St. Mary Lake. Don’t expect to get any views before arriving at the Sperry Chalet, but it’s a challenging hike and there’s a campground at the trail’s end where you can stay for a real adventure. You have marvelous views from here, and can continue on to Sperry Glacier if the fancy strikes. Hike through a burned forest then a beautiful cedar forest on this moderate hike of seven miles. Find this trailhead on the lakeshore at Fish Creek Campground. This uncrowded trail travels through extensive open areas, and you’ll get a 360-degree view at the top. Bring your camera to get a shot of Two Medicine Lake in the distance. This trailhead is .25 miles east of Two Medicine Ranger Station. This hike takes you to some beautiful sights, including St. Mary Valley and Logan Pass. 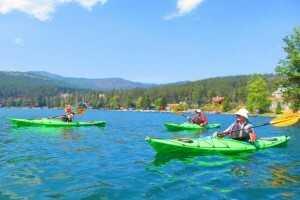 Wildlife is abundant and the Douglas firs and spruces indicate you are getting close to the end. The trailhead is located at the 1913 Ranger Station parking area at the east end of St. Mary Lake. On the Siyeh Pass loop you get it all – mountain views, tundra, cliffs, meadows and glaciers. Two to choose from at the Piegan Pass Trailhead or the Sunrift Gorge Pullout. 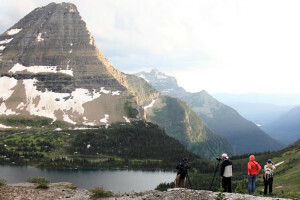 When hiking in Glacier Park, be sure to visit one of Glacier’s many Visitor Centers where you can get important information on the conditions of the trails and receive great suggestions of where to go and what to look for. If going for a multi-day excursion, you will need a backcountry permit.